Any takers for a meticulously maintained 1954 Hudson Hornet four-door sedan – a production model of the sleek, smooth-handling automobile that inspired the “Fabulous Hudson Hornet” of Disney/Pixar’s blockbuster film Cars? 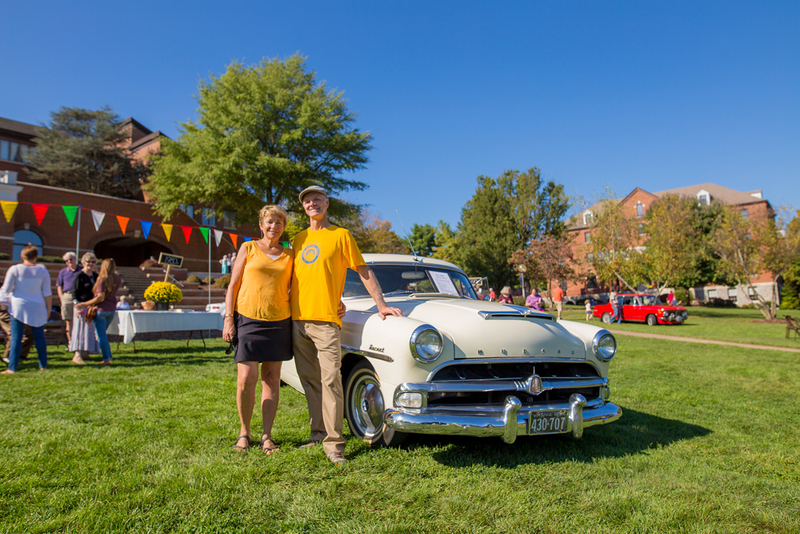 The car was put up for auction on eBay by a couple with close ties to Eastern Mennonite University (EMU), with proceeds from its sale earmarked for the University Fund, which helps underwrite financial assistance to students, as well as other institutional operating expenses. In Hemmings Classic Car, the bible of American car collecting, television personality Jay Leno, himself a noted collector, lists first-generation (1951-54) Hornets among America’s “Top 10” most collectible cars. Bids will continue to be accepted on eBay through noon Eastern Daylight Time on Saturday, Oct. 28. The winning bidder must put down a $2,000 deposit within 48 hours of the auction close, using PayPal. Full payment, in cash or by cashier’s check/money order, is required with seven days of the close. Scroll down for auction results. The car has been garage-kept for most of the 60-plus years since it rolled off a postwar Detroit assembly line. It is in mint condition, thanks to regular maintenance and upkeep from WW Motorcars of Broadway, Va., with detailing by Ward’s Auto of Harrisonburg, Va. The sellers are Alden Hostetter ’79, longtime medical director of pathology at Sentara RMH Medical Center in Harrisonburg, and his wife Louise Otto ’79 Hostetter. Louise chairs the steering committee for EMU’s current centennial celebration, which continues through May 2018. Their three sons are also EMU alumni. Alden, who describes himself as “a gearhead since I was a teenager,” says he has owned several vintage cars in addition to the Hornet. The Hostetters acquired the Hornet in 1997 from Harold and Arlene Eshleman, who were prominent members of Harrisonburg’s Mennonite community. Harold taught in the Rockingham County schools for more than four decades, serving concurrently as pastor of Chicago Avenue Mennonite Church from 1948 to 1967, and at Park View Mennonite from 1967 to 1974. Arlene was a church secretary, hostess, and caregiver. According to Ken Eshleman, Harold and Arlene’s younger son, his father purchased the Hornet in 1969 as an investment, and not for everyday transportation. Alden Hostetter says his own purchase of the car from the Eshlemans in 1997 occurred almost by accident. A friend who knew of his fondness for old cars tipped him off that the Hornet would be included in a public auction of the Eshleman estate. Alden was intrigued, but had already committed to attend a church retreat the day of the auction. Then, while sitting in a business meeting at the retreat, his pager went off, alerting him he was needed at the hospital, which at that time was located just south of Harrisonburg’s courthouse square. After Alden finished up downtown, he decided to swing by the sale on his way back to the retreat, simply to find out what sort of price the Hornet had fetched. As it turned out, he arrived just as the bidding was about to begin, and soon found himself in the thick of it. To Alden’s surprise and consternation, his was the winning bid. With Louise’s birthday just a week away, Alden sheepishly decided to present the Hornet to her as a gift. The Hostetters say their Hornet, which has been driven fewer than 57,000 miles in its lifetime, is a “great weekend cruiser,” perfect for proms and weddings. Its spacious, all-original “step-down” interior seats seven; passengers descend into its recessed floor pan rather than climb onto a floor that’s level with the chassis rails. The resultant lowering of the Hornet’s center of gravity enhances the car’s handling characteristics. Other interior amenities include opera lights, rear window vents, and a fold-down rear seat tray table. The car’s “Twin H,” six-cylinder, 308 cubic-inch, flat-head engine delivers 170 horsepower to a four-speed automatic transmission. Its cream-color exterior features all-original paint and trim. The Hornet was produced from 1951 through 1954 by the Hudson Motor Car Company. After Hudson merged with Nash-Kelvinator in 1954 to form American Motors Corporation, the Hornet was produced and marketed for three more years under the Hudson brand. The Hornets of the early ’50s figure prominently in the history of NASCAR, governing body of stock-car racing. 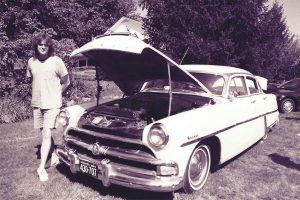 Hudson was the first manufacturer to get involved in the sport, and for a time Hornets enjoyed unrivaled supremacy on the track, winning nearly two-thirds of the NASCAR Grand National events in which they competed. 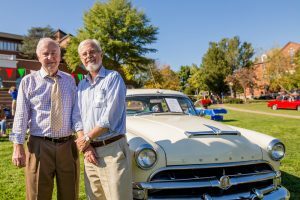 Editor’s note 12/3/2018: The car was purchased by a collector in southern Illinois and more than $16,000 was donated to Phase II of the Suter Science Center renovations.